Ok – I tried to post this earlier today and it didn’t show up on my published blog and of course I didn’t save it in a file on my computer so now I’m starting from scratch. The first one was really good, too! I just sent my Santa and Reindeer models to The Needle Works in Austin, TX. I don’t usually send them out to shops because of the wear and tear on the models, but Colleen’s new store is within walking distance of my daughter’s apartment and I’ve always had a soft spot for The Needle Works, as that’s the store that gave me my start in the needlepoint business. Back in the late eighties, I was asked to design a logo by the two owners of The Needle Works (one of those owners now produces the line A Collection of Designs). The basket full of needlework goodies logo is still used by the shop today. A few months after designing the logo, I started working part time for the shop (and I didn’t know how to needlepoint) and soon afterwards, I began painting custom pieces for the shop, plus the always fun (lol) painting names on stocking cuffs. I still have one of the canvases I designed for a customer, the golf scene picture frame #800PI, in the line today. Back to the Santa set…There’s been a lot of renewed interest in the series since we refinished the models last spring. 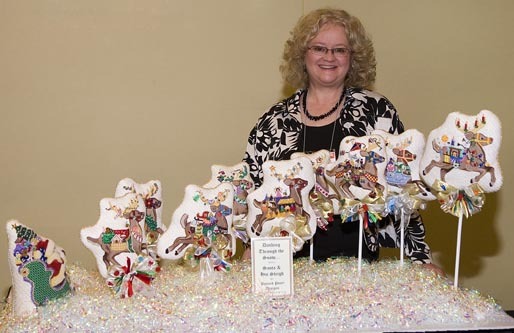 We sent them to Funda Scully in Fort Worth who redid all the bows and stands and finished the last two reindeer in the set. All the canvases come with stitch guides, written by my friend and model stitcher, Susan Burris, also of Austin. Colleen, The Needle Works owner, will be displaying the set on the mantel above her fireplace until the end of March. For those of you in the central Texas area, Colleen just moved in to her new building located at 4401 Medical Parkway. I haven’t been there yet, but everyone tells me the new shop is gorgeous! For those of you in California, Queen Anne Stitches is teaching the Sleigh series. They just started in January, so there’s plenty of time to jump into the class. Apparently, the students pick and choose which of the pieces they want to take as a class. Queen Anne’s is located in Santa Clarita. You can see the painted canvas on my web-site at: www.paintedponyneedlepoint.com and get more info about the pieces via your Local Needlework Retailer. Check out www.exclamationpoint.org, the web-site of Exclamation Point in Saratoga, CA, where I am the featured designer and the featured trunk show for February and March (thanks, Dee!). But don’t pay any attention to the picture of the short lady standing behind my reindeer set. In person, I look a lot more like Christi Brinkley – lol! Dee is offering a 10% discount of PPD canvases during February and March, so take advantage! Go to our web-site www.paintedponyneedlepoint.com and click on the Trunk Show tab (where John has hopefully updated) to see when a PPD trunk show is scheduled in your area. We have lots of new photos and info to add to the site, so check back often! Also, we are getting ready to send our Automatic angel shipments out to the shops in about a week. If you are an avid angel collector, make sure that your shop has signed up for our Auto program so that you are the first customers to see the latest additions. More on the reindeer set the next time I blog! Until then – happy stitching! Hi! And welcome to my first attempt at an e-newsletter via my new blog! I just got back from market last week and, even though the attendance was way off, I’m happy to report that the orders were good. It seems that all of my designer-friends thought so as well, so let’s keep our fingers crossed that needlepoint will soon be HOT again! We introduced 12 new angels to our line and there was pretty much across-the-board interest in all of them, but I’m guessing that the two most popular were our Pile of Packages Angel #996FU and Magi Angel #996FX. We put pictures of all the new angels, plus the six that were new at the Fall market, onto our web-site: paintedponyneedlepoint.com . Also, almost everyone ordered at least one of our new sleighs – they’re similar to our regular style with the exception being that we cut back on some of the shadow detailing we normally do to make them a little more stylized in design and to keep the cost of them down. Our sleigh 599CA is a black sleigh stuffed with packages similiar to our angel pictured above. We also had five new travel rounds and introduced a new series called Beyond Basketweave, which is a collection of 13-count canvas designs with stitch guides directed to those new stitchers wanting to learn some specialty stitches using something other than Paternayan. I’ll blog on this series in an upcoming post, but, for now, you can see the designs on our web-site. For my stitchers – thank-you so much for building my line into what it is today and by supporting our independent needlework retail shops by buying my designs through them! Finally, I have had so many stores tell me of their “Angel Collectors!” For all the collectors, here’s a list of the new angels from Fall 2010 and Spring 2011. To view photos of them, see my web-site at paintedponyneedlepoint.com ). 994DL Grand Canyon – this was the HARDEST angel I have ever designed – hope you love the result ’cause I think its pretty cool! 996FS – Starry Starry Night – this is my personal favorite and an homage to my favorite painting by my favorite painter. 996FT – Girls Rock – I have a girl and they do rock! 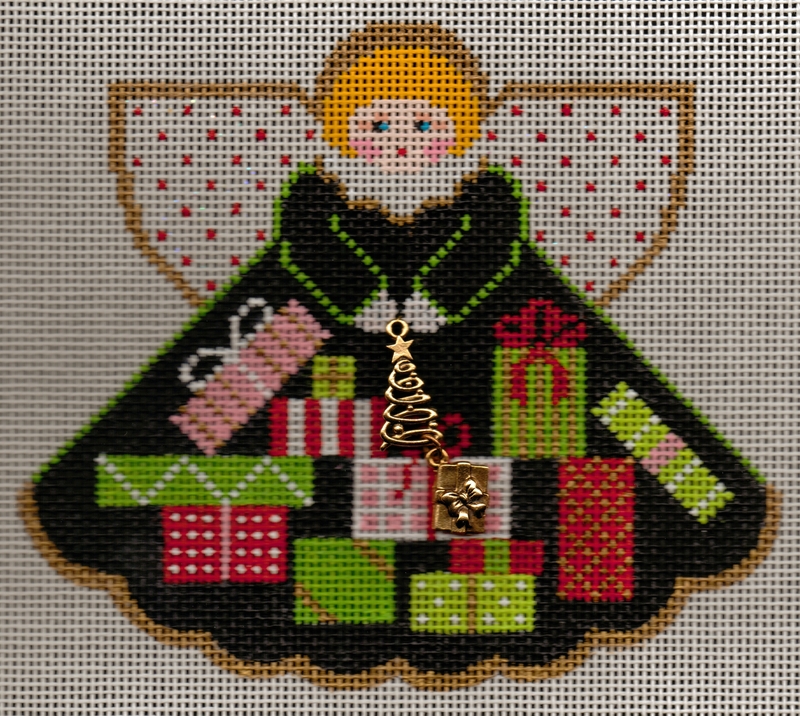 996FW – Pilgrim Angel – hat and cornucopia with a black dress – really fun to stitch!